HyperCube – A product of Bearing Point. 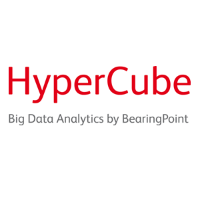 HyperCube offers a solution to quantify ‘big data’ with very high precision, to identify opportunities and hedge risks along the entire value chain. The software generates easy to understand formal rules immediately usable by end-users and thus improves the way companies make decisions. By acquiring the technology BearingPoint expands its service portfolio in the fast growing asset based consulting field and offers market-specific analytics applications. HyperCube is a unique tool which reveals risks and opportunities normally undetectable using traditional statistical methods. This breakthrough data analysis technology will dramatically improve the way companies make decisions in an environment where the amount of data grows exponentially.